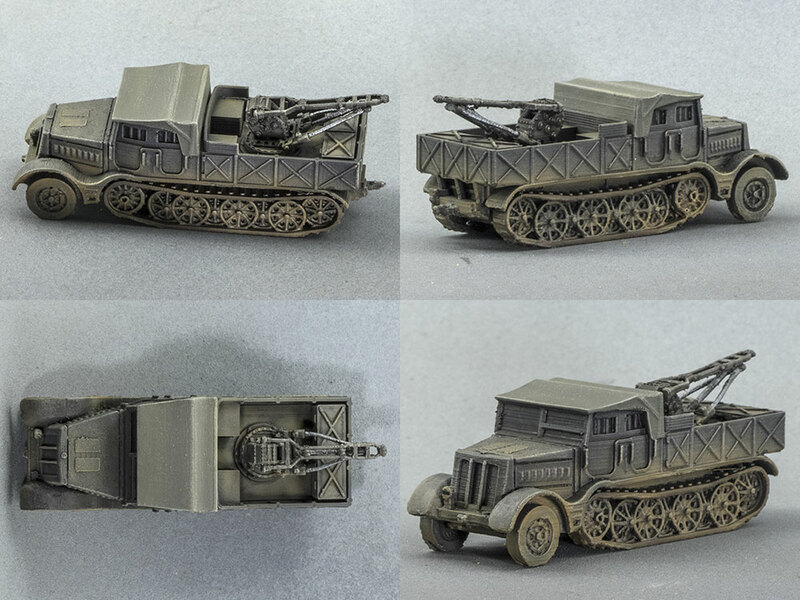 Here's my 3d printed CMP Chevrolet 15cwt light truck, all painted and crewed. The gunner is an assemblage of various bits and pieces out of the spares box; I think (though I'm not sure) that the figure is a gunner from a 25 pounder. It's from Battlefront, in any case, as is the Bren gun. 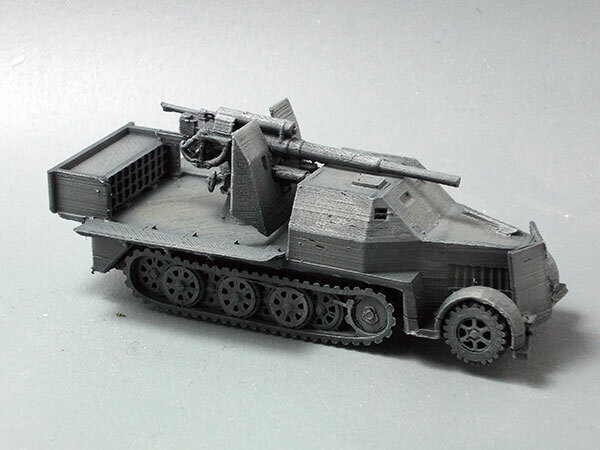 I have a bunch more of them awaiting paint, but this is the only one I've printed with the roof hatch open. 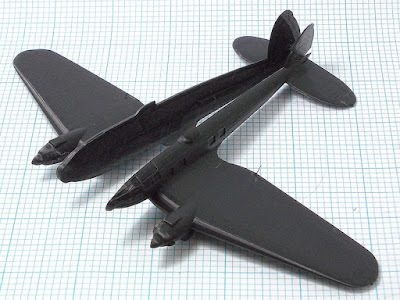 Which turns out to be a relief, since putting the gunner together was kind of a pain with my decrepit eyes and fingers. 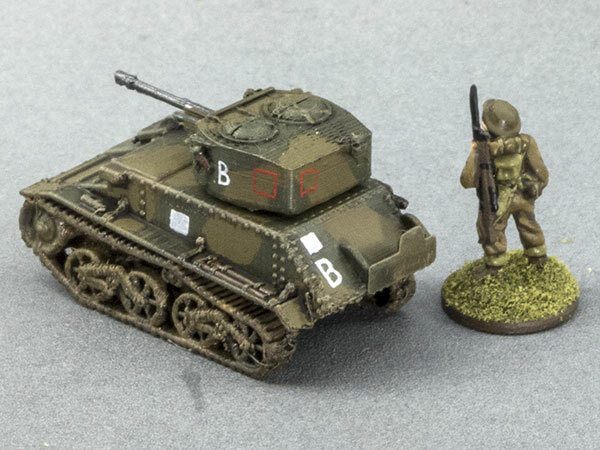 The markings are entirely specious; I know almost nothing about British WWII softskin markings, so I just made them up. The model is available from my new shop on Gumroad. 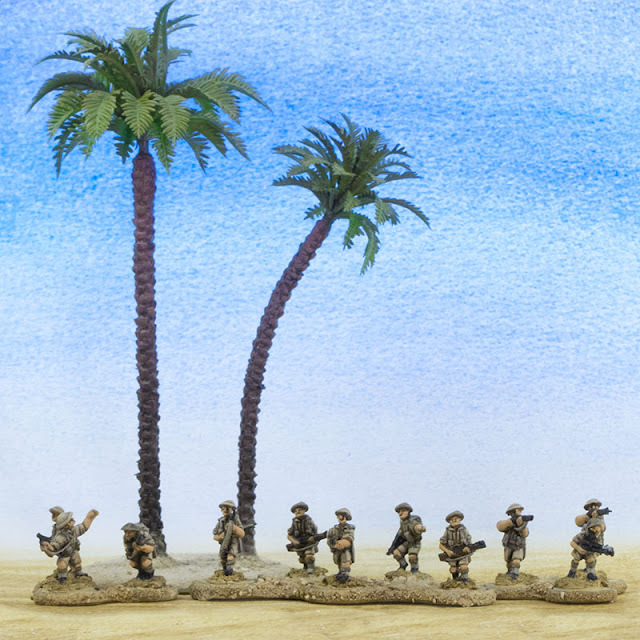 I painted these Battlefront 15mm 8th Army figures many years ago for Flames of War when it was still in its first edition, and they're pretty crappy. They really need to be repainted, pretty much from scratch. 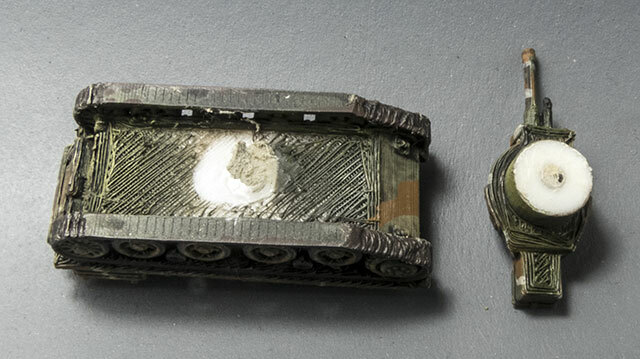 I want to be able to use them for Battlegroup Tobruk and Torch, so I've taken them off their old multi-figure FoW bases, and put them on to ½" (12.5mm) steel washers. However, moving a bajillion individual 15mm figures is a bit of a trial, especially when their exact formation isn't immediately relevant to the game. 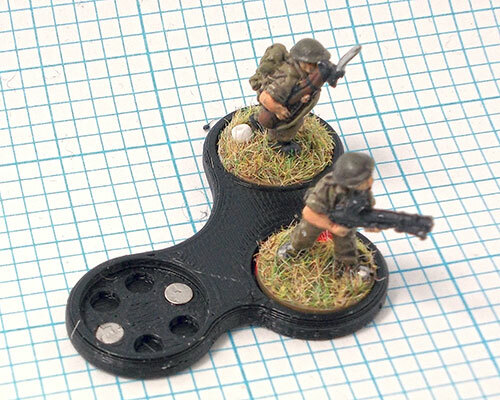 So, to combine the flexibility of individually based figures with the convenience of multiple bases, I've designed and printed some magnetic sabot bases in 5, 4 and 3 man groups. Those numbers will give me all the combinations I need with no more than two bases per unit. I use 3mm x 1mm rare earth magnets in them, cheap as chips from China. If it becomes necessary, the figures can be dismounted from their bases in the blink of an eye, or remounted again almost as quickly. I designed this ridiculous dieselpunk Land Dreadnaught for 6mm a couple of years ago, and I thought I'd rescale it and bring up the detail for 15mm–20mm. 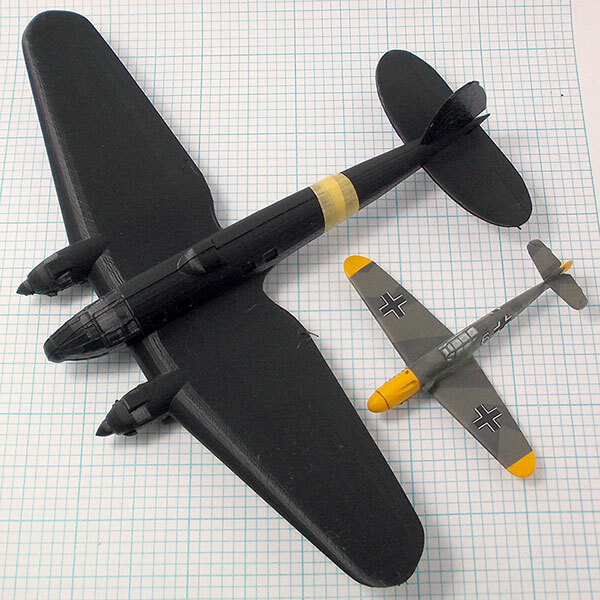 At this scale, it's about 195mm long. 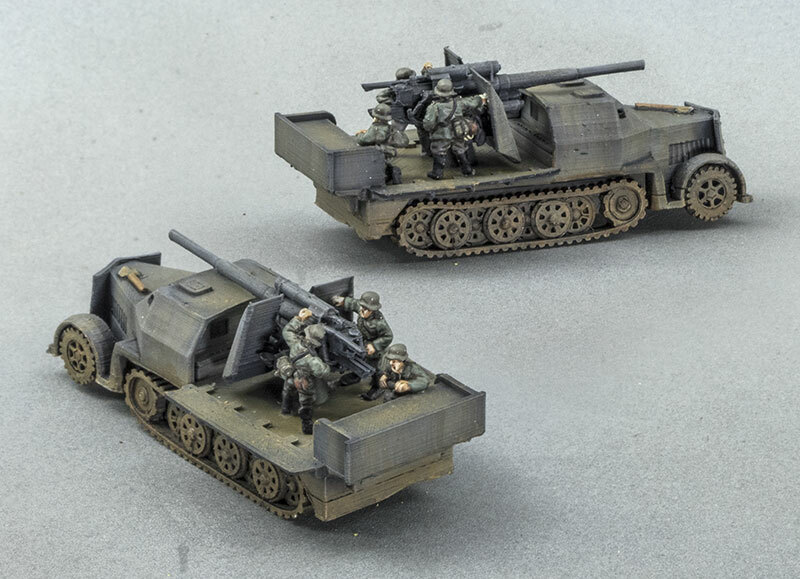 I guess it could be used for 28mm games at a pinch, though in that scale it's not really any bigger than most tanks. 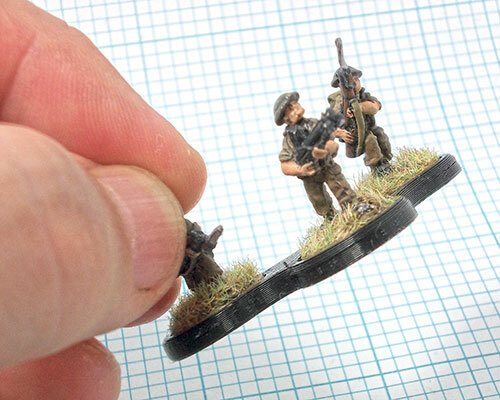 The figure is the 15mm SidScale from Printable Scenery, included to give an idea of the size of the beast. I haven't yet figured out how I'm going to split it up for printing. The turrets will all be detached of course, and sockets punched into the hull for them to rotate in, but the big turret needs a bit more work I think. 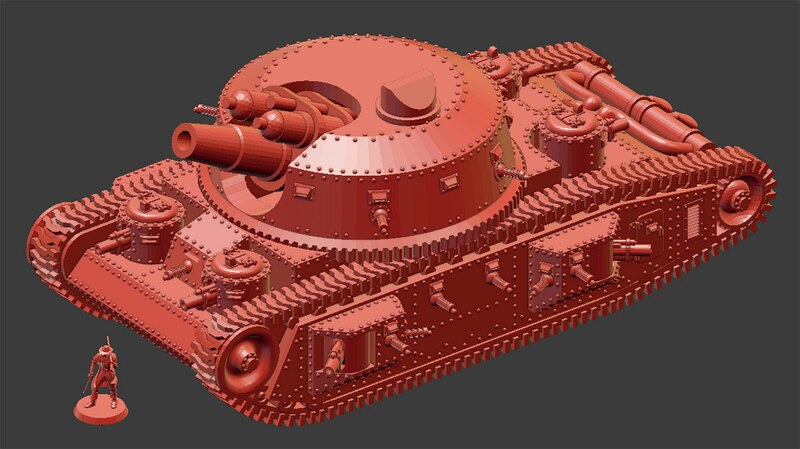 I want to make the main gun moveable, and I think it needs a bit more clutter up on the roof. Some guys on the Tabletop 3d Printing FB group suggested that it needed wider tracks, and after initially reeling in horror at the thought of rebuilding them, I realised that widening them wouldn't actually be all that difficult. 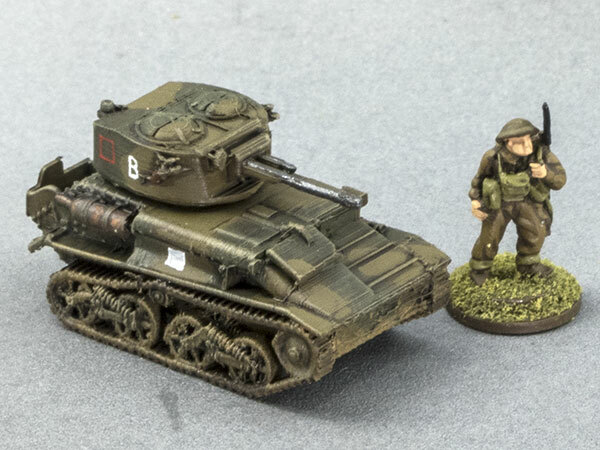 I also added a 20mm SidScale figure for size reference. I added a massive access hatch with lifting lugs to the top of the main turret, for getting that big gun in and out I guess. I also slapped on some panel lines, and some more rivets, because you can never have too many rivets. 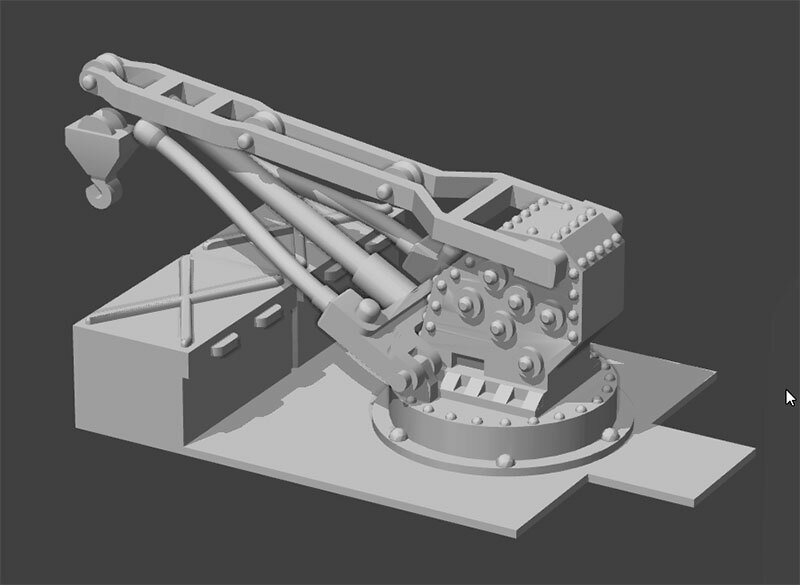 I also added a machine-gun sub-turret to the top. 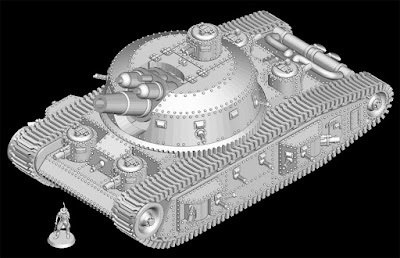 It's the same basic geometry as the other gun sub-turrets, so one could mix and match cannon and machine-gun turrets just by printing the number of each one wants. 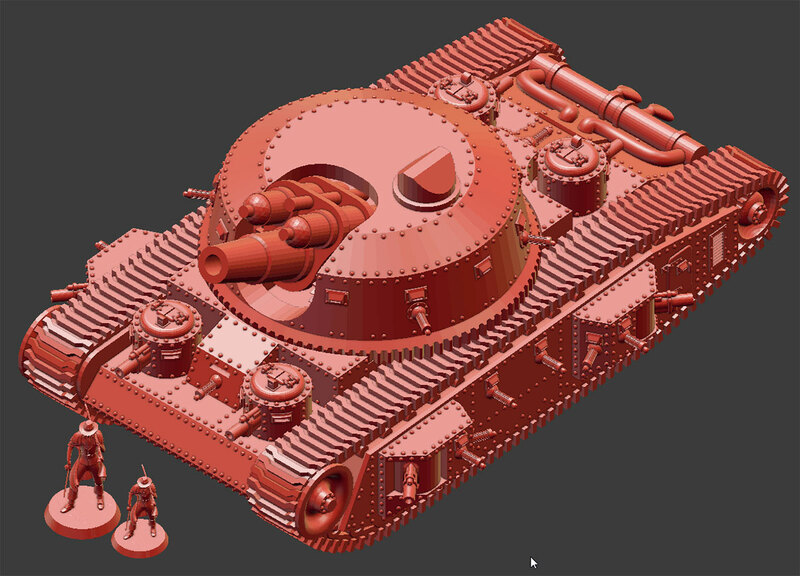 Next I need to figure out how I'm going to mount the gun so that it can be elevated or depressed, and then how to split everything up for printing. 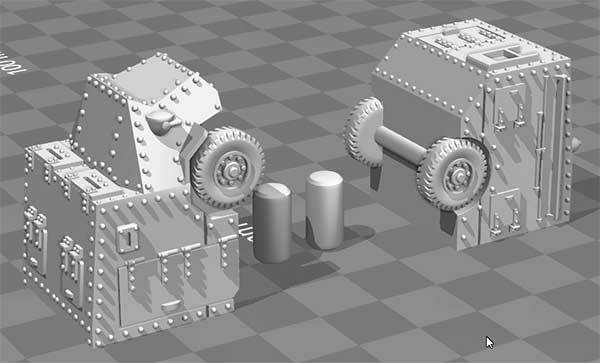 It's possible the best option might just be to only make the turrets and main gun separate objects, and to print the hull and side-sponsons all as one piece. We shall see. I remodeled my CMP Chevy 3-tonner into a 15cwt light truck. It was not as simple a job as I had expected. 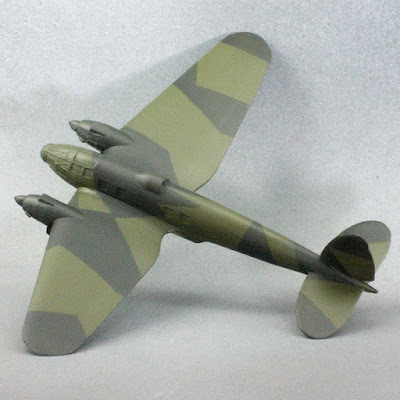 Partly due to lack of forethought in the original modeling, with respect to making changes in the future, but mostly because I decided to have a go at open flaps at the rear of the canopy, and (probably due to my inexperience with sculpting in Blender) that proved to be a much tricker task than I thought it would be. Somehow the smooth, clean sculpting the Youtube Dudes manage as a matter of course eluded me. 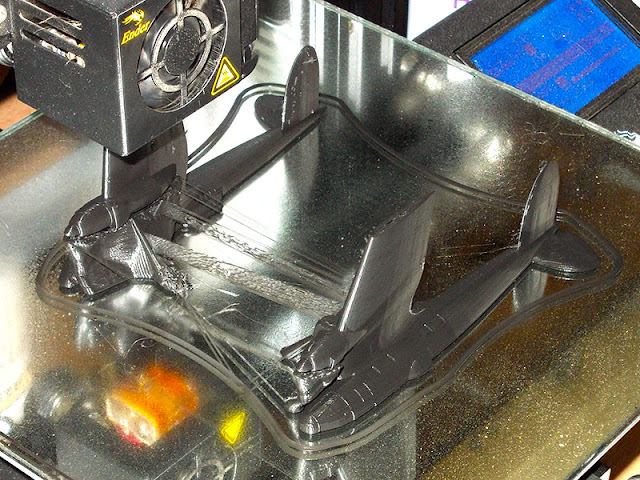 Still, it's done now, and the first test print is on the printer as I type this. Hopefully I can start to replace some of the Austin Tilleys I've been using for all my light trucking needs up until now. Here's the test print, finished. I've removed its supports and airbrushed it with a coat of primer. The officer is a WW1 british figure from Peter Pig, the guy sticking out of the roof hatch is (I think) a gunner from a Battlefront 25 pounder. Overall I'm fairly happy with how it turned out, and I've learned a bit about how not to make my life more difficult than it really needs to be. 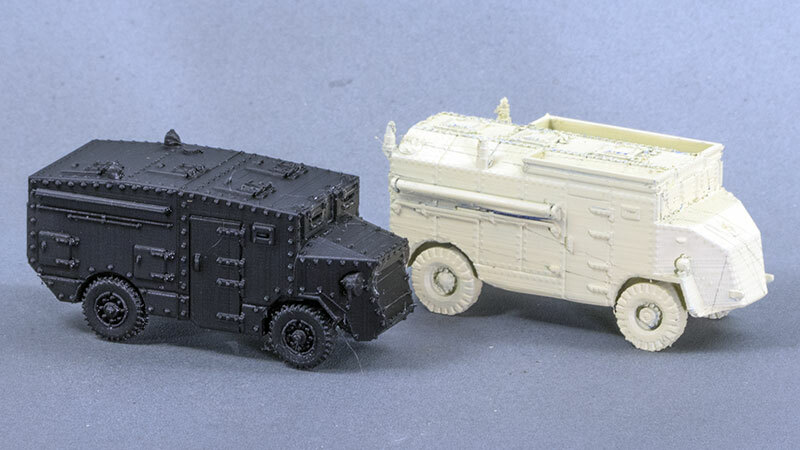 I've done a couple of test prints of the CMP Chevy model I designed the other day. 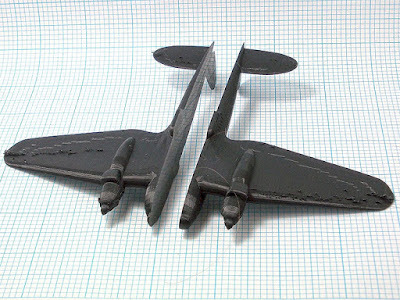 Both models have had their supports removed, and been airbrushed with a primer coat, but no other post-processing has been done as yet. 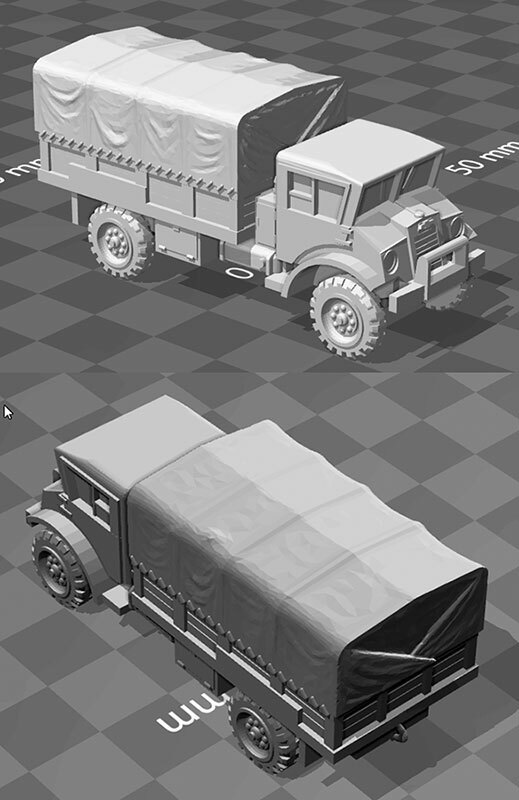 On the left, the most recent version, after I'd sculpted in the folds and billows of the canvas tilt, and printed at a layer height of 0.08mm, that being an even multiple of the Ender 3's Z-stepping. On the right, an older iteration, while the tilt was still in its basic geometry, printed at 0.1mm. 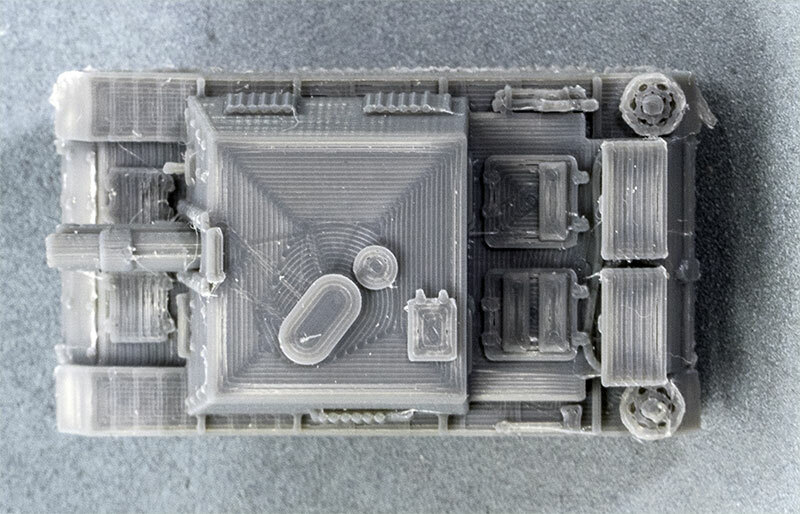 There is not a great deal of difference between the two in terms of layer artifacts, but the layer-stepping in the 0.1mm model is definitely more visibly pronounced on the sloping upper surfaces. 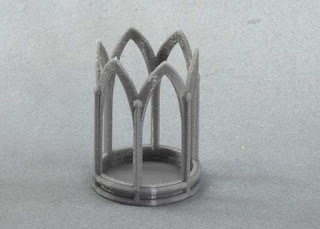 Going to the finer layers does add to the printing time — another 25% — but it will be a bit easier to smooth down the upper surfaces. As far as the sculpting of the canvas tilt goes, I'm fairly happy with it. The modelling on the sides could maybe be exaggerated a little bit more, but it doesn't need too much. Go too far, and it will start looking overly cartoonish. 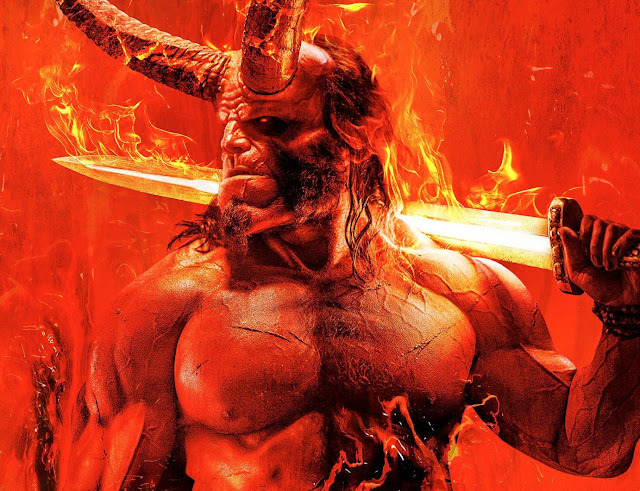 I've learned that I didn't really need to worry about pre-modelling the folds of the canvas over the ends before moving to sculpting in Blender; in fact, it probably made my life harder than it needed to be. I could have just modelled up the folds entirely within the sculpting mode. 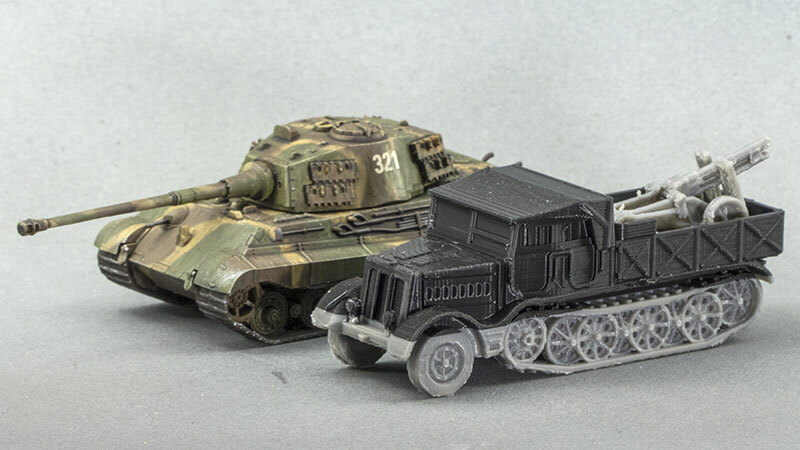 Trucks are not something that most wargames model companies tend to spend much effort on. They'll do some of the most common ones, just to show willing, and leave it at that. 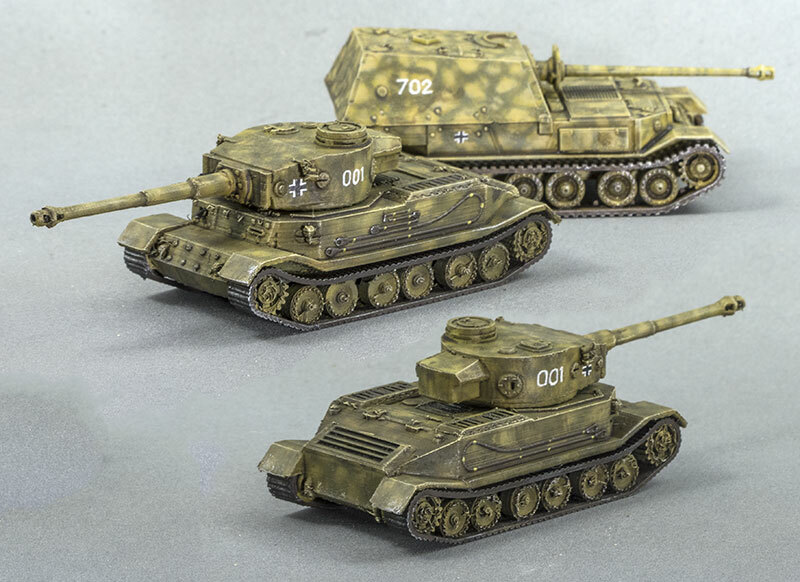 I can't say that I blame them, since most wargamers are equally uninterested in spending money on anything that doesn't have armour and goes boom. I've been looking through my old Military Modelling magazines for scale drawings of some of the more interesting looking British trucks of the interwar period and WWII. 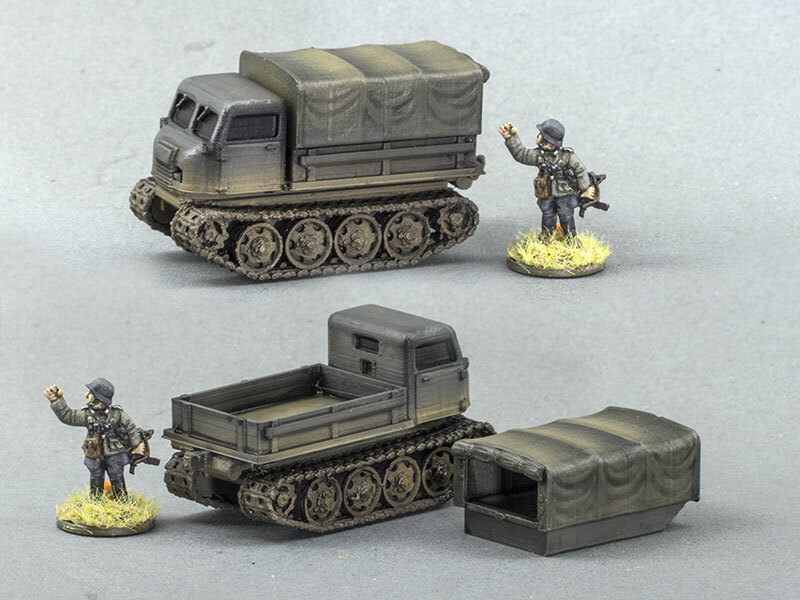 I don't really need them, as such; I have enough common-or-garden 15mm truck models to stand in when I want to deploy them on to the game table, but I'd like to be able to field some of the funkier looking vehicles that were pressed into service. 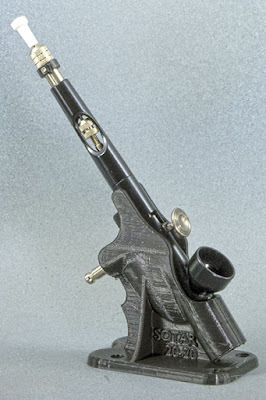 The interwar Thornycrofts, for example, that were still being used in WWII, and looked like something out of the Great War. This one is the first fruit of my digital trucking loins, a CMP Chevrolet 3-tonner. 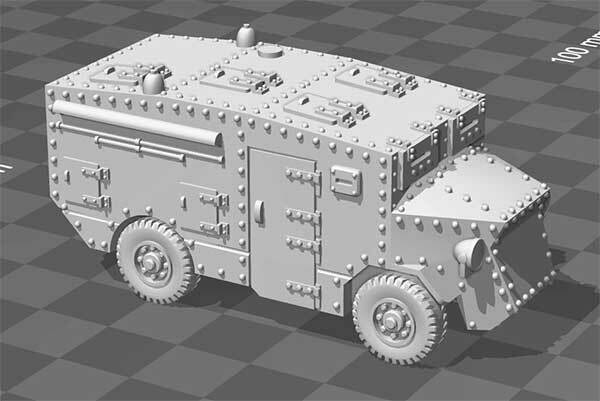 It's not a truck that is hard to come by a model of, even in 1:100 scale, but I did it to learn my way around modelling non-tankish things, and also because this one will be dead easy to change to the 15cwt version just by cutting the back in half and moving a few bits around. The main thing I need experience with is the fabric tilt — I need to learn just how far I need to take the sculpting to ensure that it looks appropriately canvas-like when it's printed on my FDM printer. I like to base my 15mm figures individually for flexibility, but it's usually much more convenient to move them when they're mounted on multiple-figure bases. The solution to this issue is, of course, sabot bases, and I've tried several methods of making them. 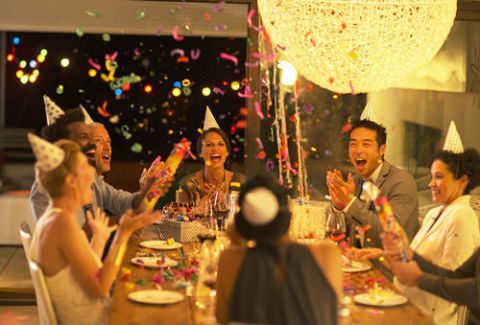 Up until now, the most successful has been laser-cut MDF, with thin card or fridge magnet material glued underneath. 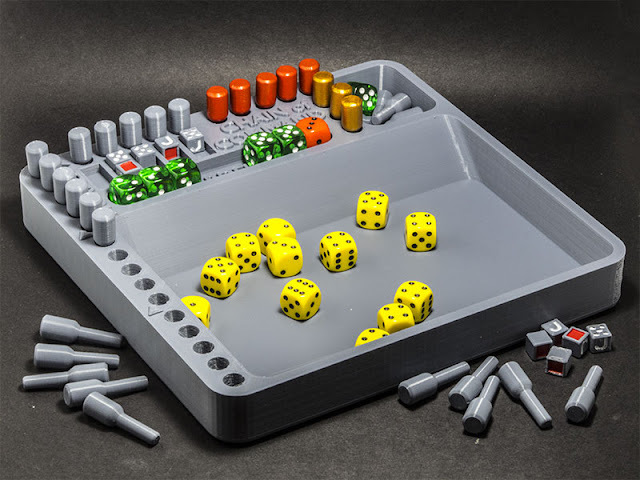 However, now that I have a 3d printer, I reasoned that I could create magnetised sabot bases with a minimum of trouble, just ten or fifteen minutes design time in Blender, and about twenty minutes to print this particular three-man base. Printing a whole army's worth of bases will take a while, but I can put them on to print at night and take them off the next morning. Easy-peasy. I use 3x1mm rare-earth magnets I bought from China. I have hundreds of them, and they cost very little — I don't recall exactly how much, but it was something like $2.50 for a hundred. The magnets are thin enough that the sabots don't have to be overly thick, and strong enough that I can pick up the whole base by one figure quite securely. 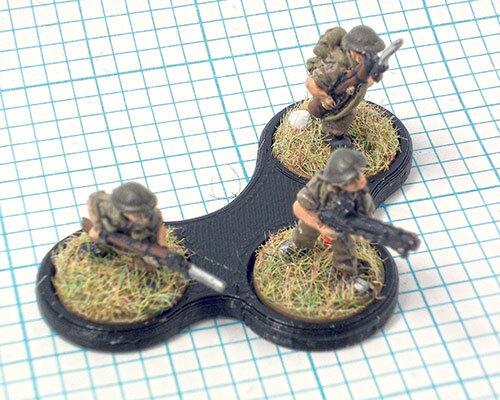 I use two magnets per socket, because I base my 15mm figures on steel washers, which have an inconvenient hole right in the middle where it would be most convenient to put a magnet. However, the magnets are cheap enough that doubling up isn't a big deal, and it does make for a more secure hold, with one magnet on each side of the base. I'll judge this experiment a success, and go ahead and make sabots in sizes to suit my army organizations. For the British, that means one five-man and one 3-man base per section, which allows me to split off the Bren team if need be. The most tedious part of making them all will be painting and flocking them to match the figure bases. 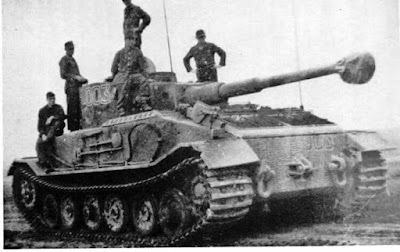 Ferdinand Porsche's submission for the chassis of the tank which later came to be known as the Tiger was not successful in that respect, but the chassis was used for the Ferdinand 88mm heavy tank destroyer. 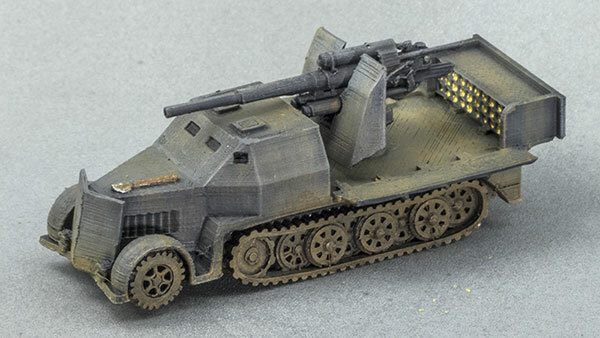 Just one saw service in the gun-tank configuration, and it was used as the command vehicle for a company of Ferdinands in Russia. It was lost in 1944. 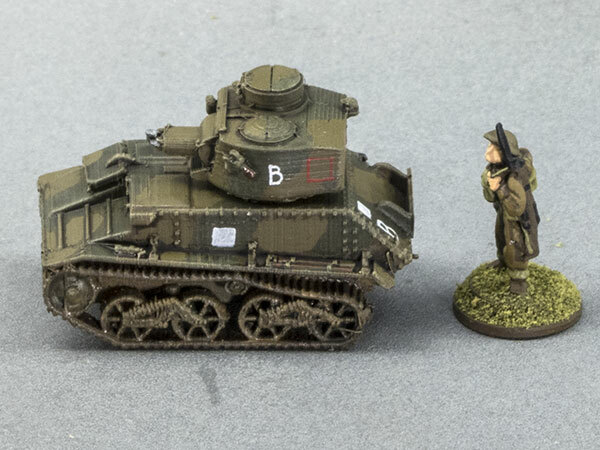 This 1:100 scale model is 3d printed, and I've photographed it with a Zvezda Ferdinand in the background. 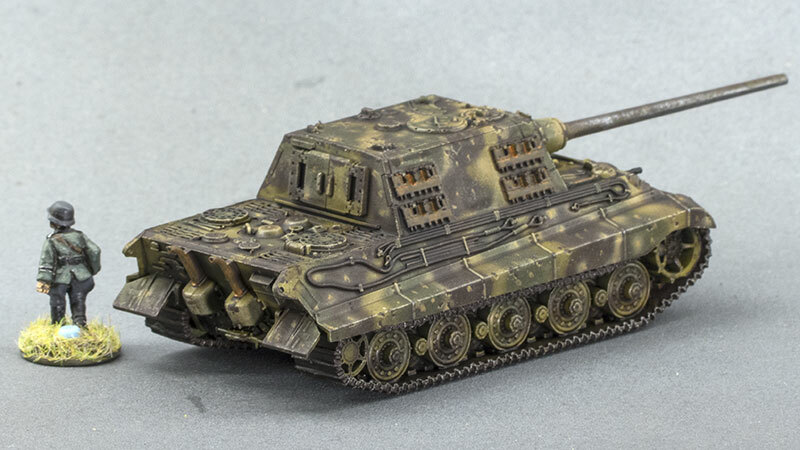 I don't know exactly what markings the original had, so I've just given it some generic command-ish markings. I'm informed that the tank was this one, Panzerbefehlswagen VI(P), turret number 003, commanded by Hauptmann Grillenberg, Eastern Front, Early/Mid 1944. 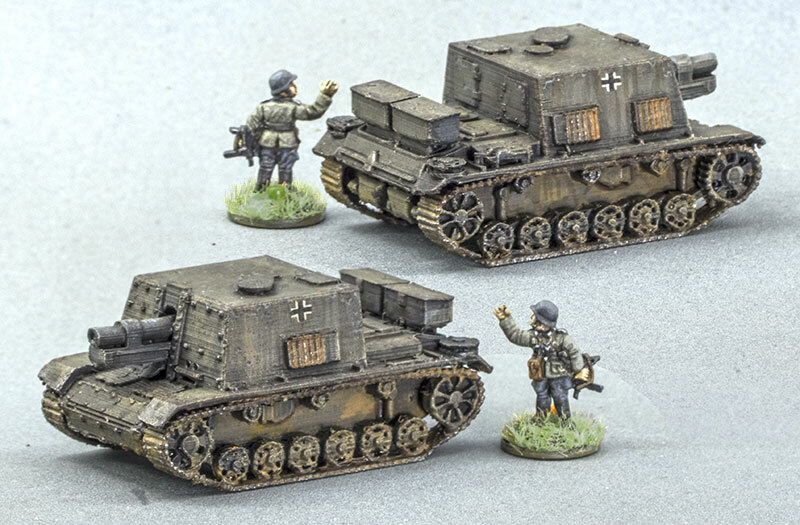 So I might have to re-paint the turret numbers. Dang. 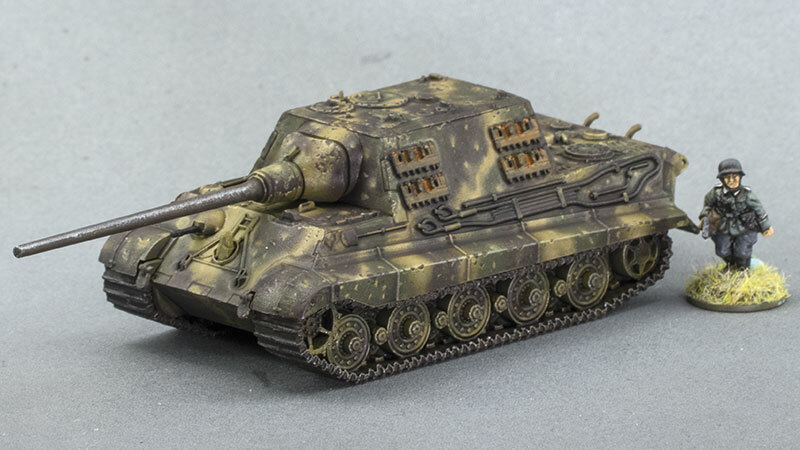 Here's the Guy Lizard ACV I showed in the raw in my last post, now all painted up and ready for service. 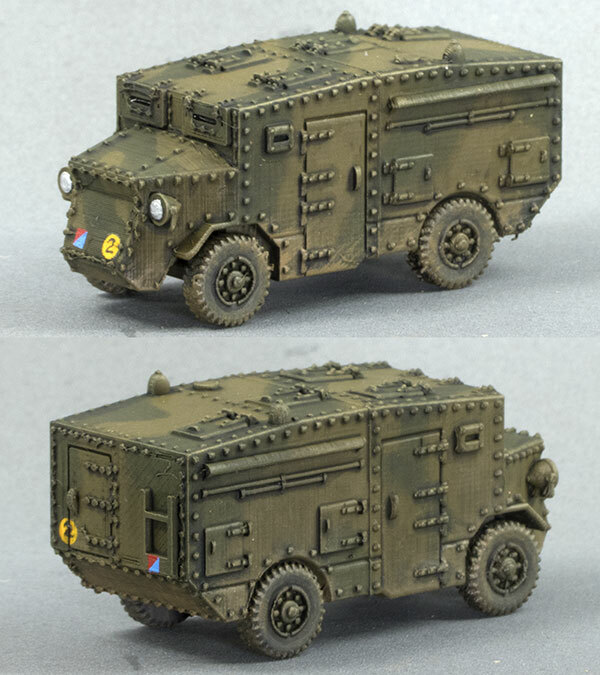 It will cost me an extra 12 points to upgrade my BEF FHQ from a staff car to this, but it might be worth it to keep them safe from my wildly erratic mortarmen. Lizard Guy. I mean, Guy Lizard. 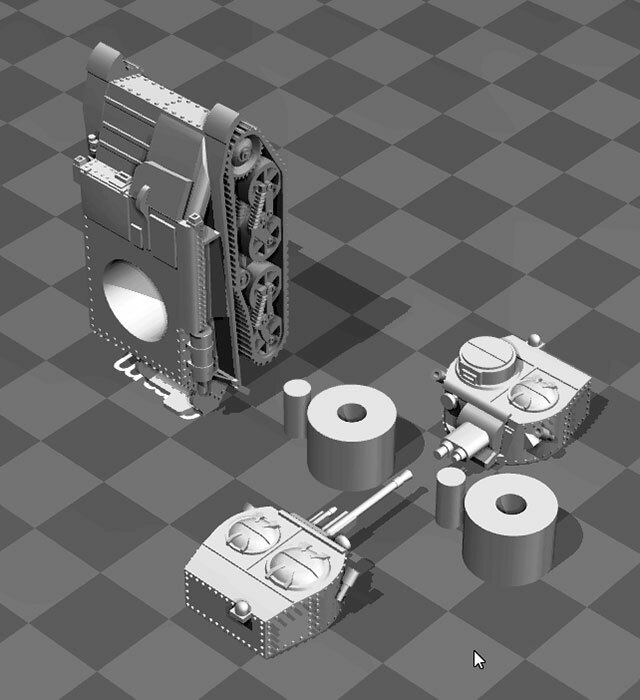 I've put together a digital model of a Guy Lizard ACV in 1:100 scale — estimated from photographs with blokes in them, since I have no concrete dimensions at hand — and I've got it on the printer at this very moment. 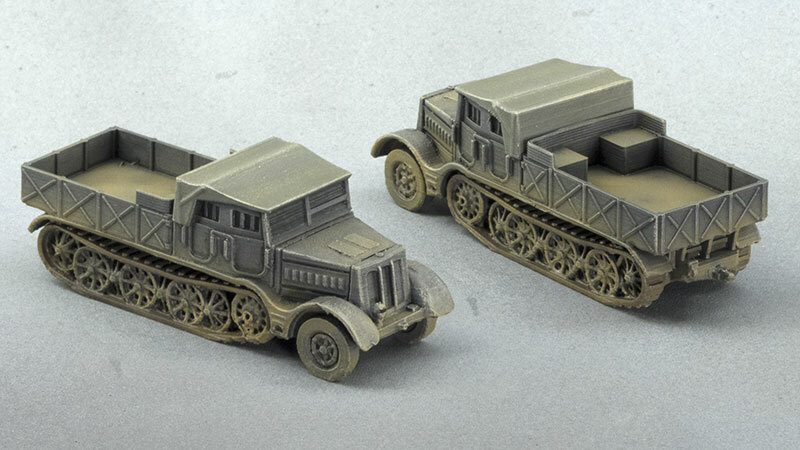 Because the roof and engine cover have such gently sloping surfaces, I split the model in half to print it vertically rather than sitting on its wheels. This minimises the visible print lines, which can be distressingly obvious when the slope is very gradual, even at very fine layer heights. I'm kind of curious to see how it will turn out, but I'll just have to wait until tomorrow morning to see. I've put the model up on Shapeways at http://shpws.me/QQLF — whether it will pass their pre-printing checks is anybody's guess, as they're steadily becoming a more and more crappy business, and their site has become next to impossible to use. Here's my two-part FDM print, fresh off the printer and assembled. I've photographed it alongside an undercoated Dorchester as a scale reference; I suspect the Lizard might be just a tad too large, as the Dorchester was noted for its spaciousness. 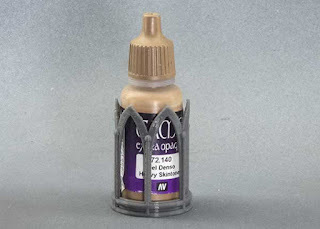 However, it's not so big that it will look out of place on the table top, and it will do for me. Shock news! 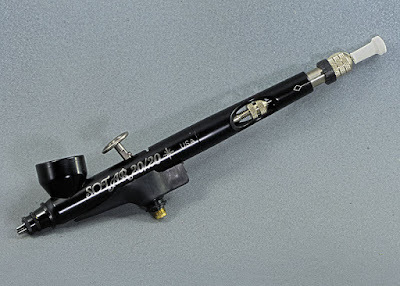 The shonky airbrush supplies company I ordered a Badger Sotar 20-20 from way back in January have finally broken down and sent me an airbrush. Not the version I actually ordered, mind — I ordered the Fine needle/tip, and they sent me a Medium — but at this point I'm prepared to call it a partial victory and just close the book. Somehow I don't think I'll be doing business with Midwest Airbrush Supply again any time soon. Maybe this is an indication they're getting their act together, maybe it's because I demanded a refund, or maybe it's just a response to the fact that I was making my displeasure known across a range of internet platforms where airbrushery types hung out. I don't know, and at this point I don't much care. I do have to say, even though they sent me the wrong version, the Sotar 20-20 is a stunningly fantastic airbrush. I'm almost afraid to use it, it's so gorgeous. The finish on all the parts is beautiful, and the action is the smoothest I've ever felt on an airbrush. I shall have to put some paint through it and see how it sprays. 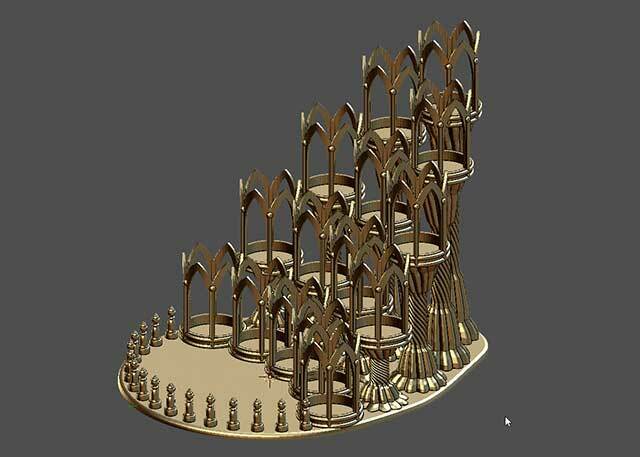 I knocked up a stand to fit it in Blender. Here's the very first output from the Sotar, with its Medium tip and needle set installed. this is all freehand airbrushing, no masking. The model is a Zvezda 1/100 scale Jagdtiger, it's about 70mm long (not including the gun barrel).